Robert Gabriel Mugabe International Airport (file photo). Fierce government critic Makomborero Haruzivishe (26) spent a night in police cells following his arrest for secretly recording and posting on social media, a video of his conversation with Robert Gabriel Mugabe International Airport officials concerning four foreign activists who were being deported. He was on Monday hauled before Harare magistrate, Ruramai Chitumbura facing a charge of "recording a video in a restricted area". Through his lawyer Gift Mtisi, Haruzivishe pleaded not guilty to the charges and was remanded out of custody on $50 bail. He will be back in court on February 4 for trial. "The accused denies the allegations and may it be put on record that the defence intends to apply for refusal of placement on remand on next date," his lawyer told court. Haruzivishe had gone to the airport on Friday to enquire about the fate of three Democratic Republic of Congo activists and an American national who were seized in a midnight raid in their Harare hotel. The activists, Jean Felix Mwema, Apollinaire Dialungani and Valmy Mwite, were deported on Friday afternoon, just as authorities handed Uzoamaka Okeke Ewo to the United States embassy in Harare with a prohibited person order. 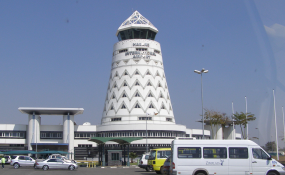 The complainant in the case is the Civil Aviation Authority of Zimbabwe (CAAZ) and is being represented by Gilbert Chimoto, the chief security officer at Robert Mugabe International airport. It is state's case that on 11 January this year, around 3pm, the informant was phoned by state security to the effect that there was a video circulating on twitter. The video covered the meeting Haruzivishe had with the Assistant Regional Immigration officer and the state security bosses. Investigations carried out revealed that Haruzivishe went to the airport to find out from the immigration officers why the activists were being held. It is alleged he went further and secretly recorded the conversation he held with the assistant regional immigration officer and other security agents without clearance. Court heard he recorded the video knowing he was in a restricted area. He is accused of knowingly sending it on social media. The state further alleged that the Twitter comments he made on his way to the airport bear the former student activist's hand as the originator of the concerned footage. Prosecutor Peter Kachirika told court that the video went viral on social media and because of that, it has compromised the airport's security. In the video, a man thought to be the immigration boss, threatens to cause their arrest and orders them to get out of his office.